Acid Reflux Herbs Treatment: Does It WORK? Acid reflux herbs treatment: is it effective? This question occupies tens of millions of acid reflux sufferers worldwide who have been let down by the conventional medicine approach. Fortunately, there are acid reflux herbs treatments that can yield immediate results for most acid reflux patients when correctly chosen and implemented. Acid reflux occurs as a result of inappropriate relaxation of the muscular valve at the lower end of the esophagus called the lower esophageal sphincter or LES. Heartburn can usually be treated and prevented through lifestyle modifications, as well as with medication. But herbs can help stop heartburn before it starts which will help to limit the number of antacids or other medications taken for heartburn relief. It is best to consult your doctor before starting on any herbs for treatment of acid reflux. Some herbs may interact with medications or worsen other health conditions. 1. Black Pepper. This is an aromatic herb that enhances taste, improves gastric circulation, and stimulates digestion. Black pepper can be added to recipes or can be an additional feature to prepared meals. 2. Indian long pepper. This is a powerful stimulant for digestion and one of the most recommended for enhancing digestion, assimilation, and metabolism of foods. 3. Ginger. Ginger has been used for hundreds of years to aid in digestion and treat stomach distress such as nausea, vomiting, and diarrhea. It is one of the most highly effective herbs for acid reflux. The effectiveness of ginger is due to its anti-inflammatory, antimicrobial and analgesic properties. Fresh ginger root can be added to recipes or added as an extra garnish to a finished meal. Ginger can also be taken in powder form and in tea. Ginger is considered to be one of the safest herbal remedies. 4. Liquorice. Liquorice is a powerful herb and anti-inflammatory showing much promise in inhibiting the development of ulcers, wounds on the mucous membrane. Liquorice also acts like an antacid. It is available in powder form and can be taken in tea. 5. Indian gooseberry. Also known as amla, Indian gooseberry is a fruit that has been used to treat peptic ulcers and indigestion. It has considerable antioxidant effects and it significantly reduced gastric mucosal injury and acid secretion. It can be eaten raw with a little salt, or in powder form. 6. Bladderwrack. Found to be more effective than antacids and also helps in indigestion. 7. Chamomile treats indigestion and heartburn. It is thought to have relaxing, calming properties to relieve the inflamed or irritated mucus membranes of the digestive tract. It even has the ability to reduce the amount of stomach acid and promotes normal digestion. Chamomile helps relieve irritation in the esophagus. 8. Aromatic herbs such as catnip and fennel are also reputed to be good for heartburn. 9. Aloe vera. It enhances digestion and absorption of food, and reduces bacterial putrefaction of food in the intestinal tract. 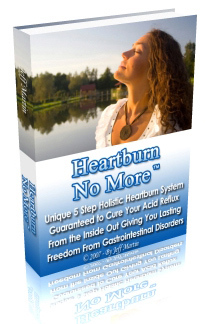 Acid reflux is best and effectively treated with holistic medicine. Some lifestyle changes along with change in diet habits, physical exercises and other modalities can cure heartburn safely and permanently.